The completed head of the giant Chinese dragon moments before it is hoisted into position on the body. 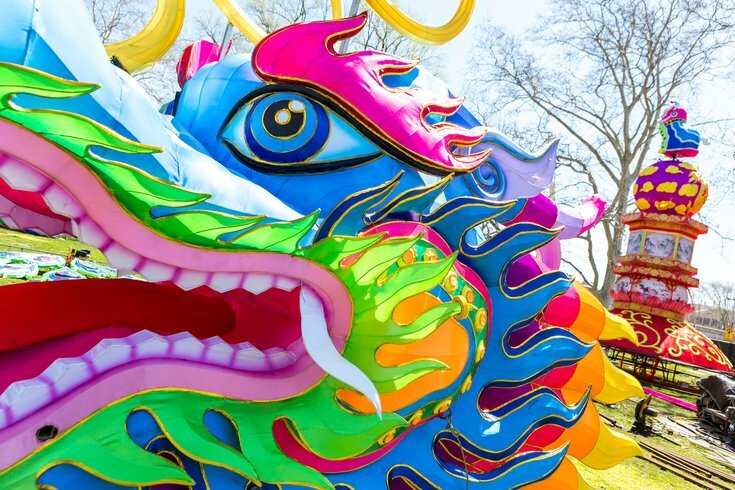 This year's Chinese Lantern Festival at Franklin Square promises to be "bigger than ever before," with all new lanterns for 2019. There will be 30 massive illuminated displays made with 2,000 individual lanterns and 20,000 LED lights. 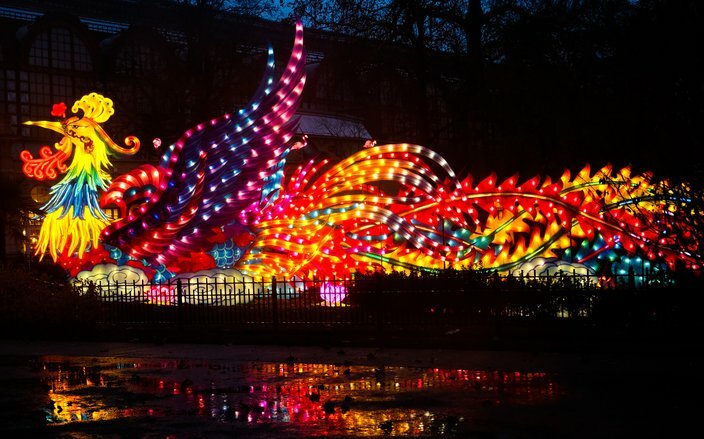 According to Historic Philadelphia, Inc., highlights include a 200-foot long phoenix, a dragon tunnel guests can walk through and interactive installations like a fortune-telling wheel. A giant phoenix – similar to this one – will replace the dragon of previous years. The family-friendly festival will return to Philly on May 1. Guests will be able to check out the lanterns in the seven-acre park through the end of June. Tickets ($12-$20) are now on sale. After 6 p.m. a ticket will be needed to visit Franklin Square, but during the day the park will be open and free. In addition to the lanterns, the festival will feature authentic cultural performances. There will be both Asian and American cuisine for sale, and the Dragon Beer Garden will be open nightly. Also, there's an opportunity for kids to design a lantern for this year's festival. Children age 8-14 are invited to submit a drawing of a pig to celebrate 2019 as the Year of the Pig. The winning drawings will then be made into an installation by artists from China. March 25 is the deadline to submit.